"The end goal of corrections is enhanced public safety, not enhanced punishment for punishment's sake." The above quote is from Christopher Zoukis, the author of College For Convicts and the just released Prison Education Guide. And frankly, on one level Mr. Zoukis' words are inflammatory and highly controversial because poking around the unsavory concept of prison and punishment and corrections exposes intrigue and malice and indifference of gargantuan dimensions. This is because opinions vary from the very liberal to the notoriously conservative. Liberals perceive the present state of corrections as corrupt, while the conservatives perceive it as permissive. Liberals prefer rehabilitation; conservatives beat the drums for retribution. Who is right? Who is wrong? Well, as Mr. Zoukis points out so eloquently in College For Convicts, right and wrong are irrelevant because in the end, the corrections problem boils down to money and efficacy, which emasculates both rehabilitation and retribution. Rehabilitation implies therapy, psychoanalysis and psychotherapy, even job training. Retribution implies revenge, punishment and payback. Both options are expensive and ineffective. The answer, according to Mr. Zoukis, is education. The cost of educating prisoners is relatively cheap, around $3000 per prisoner per year, whereas the cost of incarceration runs anywhere from $35,000 to $60,000 per prisoner per year. At the present juncture, the U.S. spends approximately $80 billion per year housing prisoners, most of whom are non-violent offenders. In other words, by spending less than 10 percent of its yearly budget, corrections in the U.S. could educate prisoners, releasing them back into the general population, where, because they are now educated, they would become effective contributors to society. 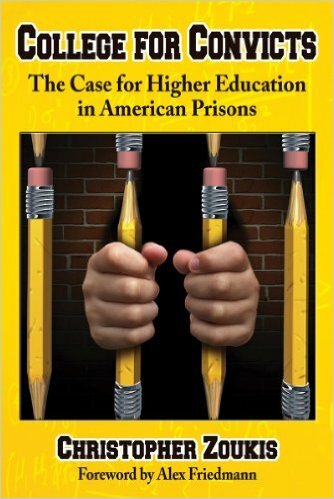 Sadly, most prisoners are in prison because of their paucity of educational opportunities. College For Convicts presents the facts, figures and rationale for educating prisoners. Prisoners with a college degree are much less likely to recidivate. Retribution actually increases the likelihood that released prisoners will recidivate. Yes, the prisoner has been punished. But he's still the same person; he's no smarter, has no skills to land a job and is embittered. The same is true of psychological rehabilitation. Yes, the prisoner now knows he has to make good decisions; but once again, he's no smarter, has no job skills and no experience or frame of reference for making good decisions. On the other hand, education actually changes the prisoner's way of thinking, the way he processes information. In College For Convicts, Mr. Zoukis walks the reader through the various research, studies and conclusive evidence for educating prisoners. In the end, the conclusion is axiomatic: education is not only cheaper, but it's right. And it's the only way to successfully "correct" the intellectual processes and the behavior patterns of prisoners. Mr. Zoukis presents the case for higher education in American prisons in a logical, cogent manner. College For Convicts is a necessary book, not simply for the average person, but especially for law makers and policy makers. Find out more at: prisoneducation.com and College For Convicts.